The Venerable Professor Dhammavihari (formerly Professor Jotiya Dhirasekera) passed away yesterday. The passing away of the Venerable Professor Dhammavihari Thera marks the departure of one of the most respected elders of modern Buddhist studies, who was an intellectual, philosopher of art and independent thinker. He was 89 years and till the very end of his life the erudite Thera was active in both national and international spheres of Buddhist religion and scholarship. When the Venerable Thera entered the Sangha, 19 years ago, as a pupil of the Most Venerable Madihe Pannasiha Mahanayake Thera, he was known as Professor Jotiya Dhirasekera, and had recently retired from his university service as the director of Postgraduate Institute of Pali and Buddhist Studies, Kelaniya University. Immediately prior to this, he served as the Editor-in-chief of Encyclopedia of Buddhism, a project of the Cultural Affairs Department. Born and raised in Tangalla Dhirasekera started his university teaching career in 1946 at the Colombo University, right after completing his first degree at University College, Colombo. Illustrious scholars such as G.P. Malalasekera and O. H. de A. Wijesekera were among his teachers who later became his senior colleagues. Although Dhirasekera specialized in Sanskrit he was appointed to teach Pali, a subject in which he was able to make an original contribution in the course of time. He received training in classical Chinese language at the Cambridge University for two years, and this training gave him access to the Chinese religions which were crucial in interpreting the Pali canonical texts. Dhirasekera's understanding of the Dhamma and the Vinaya, substantiated by his critical appraisal of texts, was of very high standard. This is amply proved by his doctoral research in the Buddhist monastic discipline. In this research, which was later published under the title of Buddhist Monastic Discipline, he corrected many misunderstandings of previous researchers. Professor Dhirasekera was a textbook example of critical scholarship. A student may find it very hard to digest all the critical comments that are coming from him. But one would never be the same facile and naive person once exposed to the shock of Dhirasekera. His being a kind-hearted teacher and great admirer of beauty (a characteristic which pervaded his entire life) never compromised his thoroughness as a teacher and researcher. As a university teacher at both Peradeniya and the Toronto University, Canada, and as the Editor-in-chief of Encyclopedia of Buddhism and as the director of Postgraduate Institute of Pali and Buddhist Studies, Professor Dhirasekera dedicated his life to teaching and conducting research in Buddhism. The culmination of this long academic career was his decision to put into practice in a serious manner what he taught many thousands of students during his entire professional life. 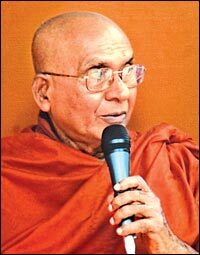 Accordingly, at the ripe age of 70, Prof. Dhirasekera obtained monkhood under the tutelage of the late Most Venerable Madihe Pannasiha Mahanayake Thera, receiving the monastic name, Dhammavihari, one who lives the Dhamma. Unlike many others, the new novice had little to learn anew for he was well versed in all the Vinaya and the Dhamma. Thus began another phase of life of Prof. Dhirasekera as a member of the Sangha. Venerable Prof. Dhammavihari brought along with him a critical outlook to the Buddhist monastic order which has remained largely traditional and orthodox. He took upon himself the role of correcting misunderstandings and misinterpretations of the Dhamma and the Vinaya and establishing their correct meaning. While he respected the tradition deeply, he did not have any hesitation in pointing out clearly and loudly what he realized to be not in accordance with the Dhamma and the Vinaya, whether it be the great commentator Buddhaghosa or any lesser known modern scholar. As a university teacher he loved his students and guided them not only in the academic subject he taught but also in the larger arena of life. As a Buddhist monk, he was the beloved teacher of many who belonged to various age groups and various cultures and countries as well. Prof. Dhammavihari loved telling people what he knew; he was a born teacher with warmth, kindness and affection towards his students. People nevertheless approached him with some sense of hesitation for his sharp intellect was inescapable. The demise of the Venerable Prof. Dhammavihari Thera leaves a great vacuum in the modern Buddhist scholarship. He was one of the few left that linked the Buddhist scholarship of the early 20th Century to that of the early 21st Century. He belonged in a vanishing breed that had a holistic vision of reality going well beyond the narrow confines of one's academic or professional specialization. He was one of those rare people even random encounter with whom was an educational and edifying experience. I bow my head to this great son of the Buddha who dedicated his life to do what he said. May the Thera attain the Supreme serenity of Nirvana!